Brought to you by NovomaticCasino.co.uk, this slot is glamorous, glitzy and a whole load of fun. 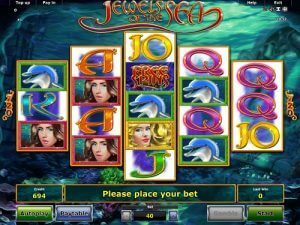 Fans of Dolphin’s Pearl Deluxe, Lucky Mermaid and Lucky Lady’s Charm are sure to enjoy this slot. The detail that has been put into this game during its design process is incredible. The symbols are all unique and amazingly well-made and the background; the swaying ‘Jewels of the Sea’ logo; the music and the sound effects all come together to give this slot its underwater feel. There’s absolutely nothing generic about this game! Give it a go and see for yourself. The lowest-paying symbols, which still pay out nice amounts, are the card values from the 10 to the Ace. Each one has a unique colour, just as if they’re the coral brightening up this beautiful seascape. The cheeky dolphin pays more than the cards and the beautiful mermaids pay even more than him! The aim of the game is to spin three or more matching symbols on the reels and this game is unique in the fact that there are no paylines – which means there are an astonishing 740 ways to win! I like those odds! If you spin 5 of the beautiful brunette mermaid, you’ll be paid 5x your bet amount, whereas spinning 5 of the buxom blonde will give you 10x your bet! Jewels of the Sea might seem like a complicated game at first, but it’s just because it’s so lucrative, it’s difficult to comprehend, at first, all the different ways you can win! But when has so many ways to win ever been a bad thing? Never! Your bet amount is clearly displayed for you at the bottom of the screen, in the middle, and your balance is always on the right, with your last win always on the left. Changing your bet is simple and easy, and you can increase it or decrease it to suit your needs. You can consult the pay table at any time to see how much each symbol will pay out, depending on your bet. In Jewels of the Sea, there are two special symbols: the Wild symbol and the Free Spins symbol. The Wild symbol can appear on the 2nd, 3rd and 4th reels and it’s a scroll with ‘x2’ painted on it in red. Each time one of these Wild symbols lands in a winning combination, the win will be processed twice! Nice! The ‘Free Spins’ symbol is just as fantastic! If 5 Free Spin symbols land on your reels, one on each reel, 8 free spins will be triggered and so will a x1 multiplier! During these free spins, you can also win more free spins and higher multipliers! In this slot, you can win up to 96 free spins with a multiplier of x12! As with most other Novomatic Slots, you can play Jewels of the Sea for free until you’re ready to play with and win real money! When you’ve got the hang of the game and don’t feel like continuously clicking, you can put this game into ‘autoplay’ mode and let the reels spin themselves. Another great feature is the gamble feature which enables you to turn even the smallest of wins into something altogether more significant! Each time you get a payout, all you need to do is have enough faith in yourself and the courage to click ‘gamble’ instead of ‘collect’! Then, you’ll need to guess which colour the next card will be: red or black. If your guess was correct, your win will be doubled and you will be able to keep going and keep doubling your win! If your guess was incorrect, however, you’ll be back to the reels without your original win.